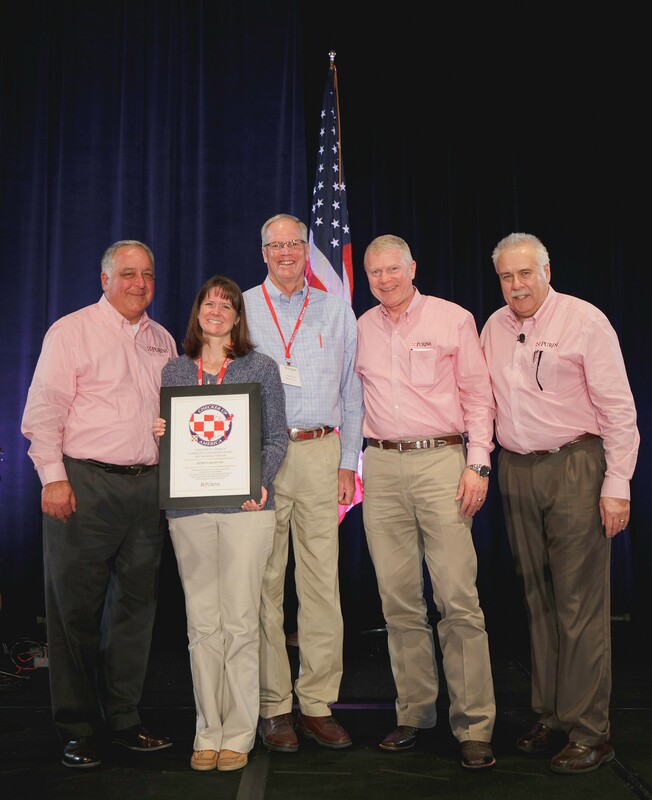 Olsen’s Grain was recognized by Purina Animal Nutrition with the “Checker Up America” Community Leadership Award in February, 2015. 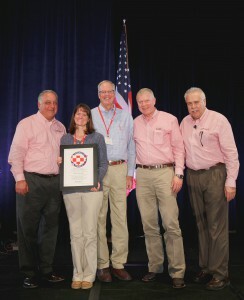 Mike Olsen and Michelle Gronek received the award during a Purina Animal Nutrition Dealer meeting in Austin, Texas. The “Checker Up America” Community Leadership award is presented by Purina Animal Nutrition to a handful of Purina dealers who exemplify community service and leadership. Below is the citation that was presented to Olsen’s Feed employees Mike Olsen and Michelle Groneck. While calling someone “ a pillar of the community”, in the case of Olsen’s Grain it is not an exaggeration. The Olsen family believes taking care of their employees and the community at large is an important aspect of having a thriving business. They organized a fund-raising event and donated the proceeds to help support the families of the fallen 19 firefighters of the Granite Mountain tragedy in Arizona. Every year they hold the Arizona EquiFest Team Roping, that raises funds for the Olsen’s Scholarship Fund supporting local high school students. In past years they’ve also held Team Roping events to raise funds and awareness for the fight against breast cancer. And for the past 12 years, they present an equine and pet mega-event that is free to the public called Arizona EquiFest. One year, proceeds from EquiFest were donated to the Yavapai County Food Bank. FFA is an organization very near and dear to their hearts, as they have held team roping competitions to raise funds to support the chapters in their area, as well as supporting the chapters through direct donations and allowing fund raising activities in all their stores. They donate dog food to all the K-9 units in Yavapai and Coconino counties for the life of the dogs. Olsen’s also supports the Yavapai County Humane Society and United Animal Friends annual events, as well as discounted dog food throughout the year for the shelters. Olsen’s Grain believes in giving back to the community that has supported their business for over 35 years. It is this pride in their community that makes them such a beloved and respected business by their customers. Mike and Michelle, congratulations to you and your folks back home. Well done!